For those of you who have a big ol’ butcher block or wood countertops or really anything made of wood that could use a little extra care and lovin’: spoons, cutting boards, plates, juicers, teethers, baby toys, blocks etc. this one’s for you! So basically everyone, ha. Here you are dears, a little tutorial on how to make the most of all things wood with two natural, non-toxic ingredients. Every few months Andrew or I take this buttery concoction and treat the big butcher block that anchors our kitchen, plus all the other wood trinkets we have around our home. Depending on the wear of my wooden utensils and bowls, I’ll coat that when we do the island and give it a hearty buff for good measure. 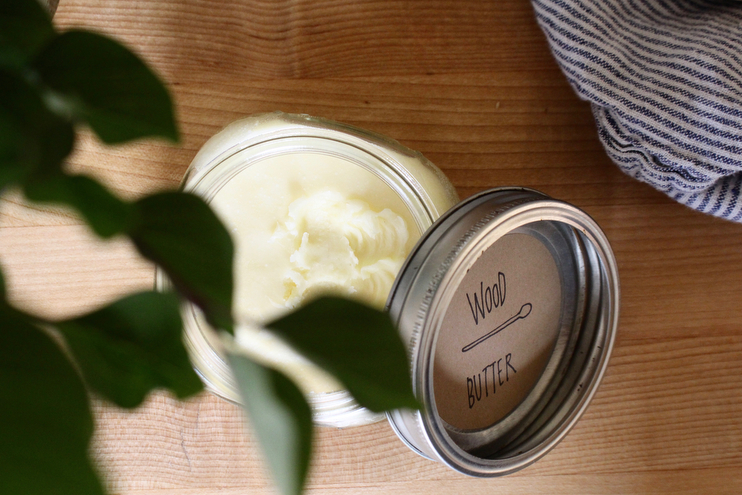 This simple product puts life back into the wood and moisturizes it, keeping it from drying out and cracking. To prepare, measure out a 1/4 cup or so of beeswax pellets and 3/4 cup or so of coconut oil and put them in a glass jar. A mason jar is perfect for this. And you should know, I usually eyeball this recipe like I do most everything in the kitchen which is why baking and I aren’t the best of friends. I prefer beeswax pellets to buying a block of beeswax because they melt much faster and are easier to work with. If you are wanting to breaking off bits from a big, hard block go for it! I opt out of this one and use the pellets. For the next step, set the glass mason jar in a pot, say your dutch oven, and fill it with several inches of water. Let the water simmer (avoid boiling) and as it does it will melt the beeswax and coconut oil together into a beautiful, golden, buttery concoction. 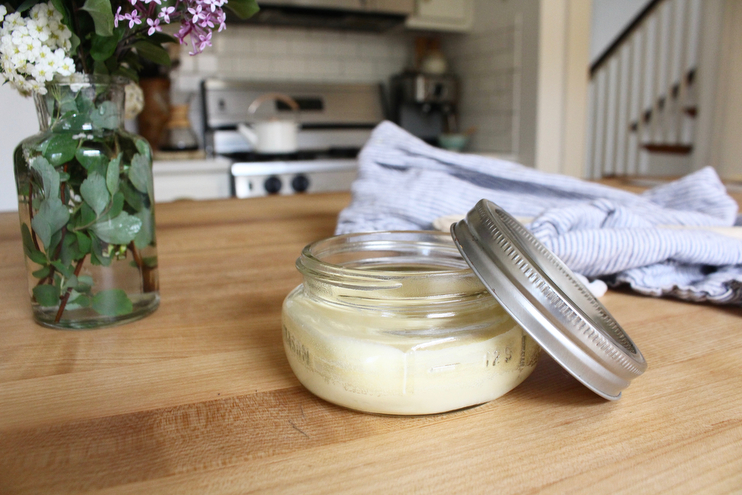 Once melted, you can take this jar and leave it as is on the countertop to cool and set. Make sure to place it far away from where little fingers can reach. Another route you can go is to pour it into smaller jars once melted and give these away to friends for birthdays or holidays. I sent this out as a little Christmas gift a few years back with some small wood cheese knives. It was a big hit! My mother in law still uses the mixture I made on all of her wood spoons and cutting boards, proving that a little of this wood butter goes a long way. No matter the size of jar, large or small, there you have it. 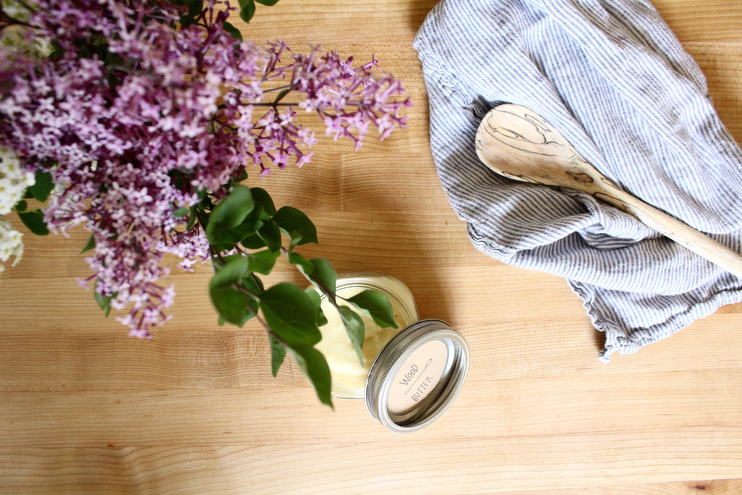 A simple recipe for conditioning your wood that uses all-natural, wholesome ingredients sans mineral oil! Using this butter couldn’t be easier. With an old towel, try to stay away from the paper variety, rub in the butter very liberally and let whatever you are conditioning sit overnight. Better yet, leave it alone for 24 hours. In the morning or whenever you get around to it, take another old towel and buff the wood, rubbing the butter in even more. That’s literally it. Also, your hands will be really happy after you’ve used this butter. Think of it as your cuticle treatment! Happy conditioning to ya. Where do you find beeswax pellets? Would love to know a reliable source! Many thanks! I’m really kind of of confused as to why you take so much credit for white paint in your design sponge article. I guess no credit is due for the original owner. I honestly cannot believe you are friends with them. You could have said in the design sponge article that you knew the person that sold the house to you guys and most of the renovations were done before you guys moved it. You didn’t even picked the light fixtures, Jami Nato did. All you did was repaint, bought in your own furnitures and thats it. I am a stay at home mom and look after our three little ones, Stella 4, Theodore 2 and Alfie almost 1. I was born and raised in the Midwest and like a good ol’ cliche married my high school sweetheart, Andrew. We moved to Kansas City to have and raise our family where I taught for four years before leaving that to stay home. I write a blog called Homesong about home keeping and slow living with kids. It’s a passion and joy of mine to be able to do so! Andrew works as financial planner and loves his job. Our little ones enjoy adventuring around the yard, making crafts, helping mama in the kitchen, digging in the garden and playing with their toys. The story behind choosing our home is an interesting one. We had been on a search for an older, larger home in the same historic neighborhood we currently lived in whilst in a small condo, but every time something we loved came on the market it was scooped up too quickly! This area is gorgeous with all of its parks and trees and growing families. We were told of this home and it’s potential to go on the market from my best friend. This house was a friend of hers and we arranged to take a look at it one evening, not really hoping for much. Andrew and I pulled up to the cobblestone walkway and saw the big side porch with a big tree swing and we immediately felt in love. Walking through the house itself and seeing all the preservation with regard to the original features made this house that much more appealing to us. It ticked all the boxes on our wish list so we put an offer on it that night and didn’t look back. It has always felt like home here. Tell us a little bit about your PROCESS of turning your space into a home. How long did the process take? If there are any interesting stories that happened along the way, do tell! The first major step we took to turn this house into our home was to paint everything. There were multiple layers of paint and wallpaper on everything (ceilings included!) and that took a bit of work to get off. The walls needed many coats of paint but once finished the results were night and day. We opted for neutral tones in the white family to freshen everything up and show off all the charm in this home. With so many beautiful features like built-ins and gilded lighting and original tile work, the neutral pallet really lets these beautiful, old parts of our home shine. Two years later we are still doing things here and there to turn this into our dream home, but from the start it has always been a joy to live here. We are currently in the process of giving the front of our home a complete face-lift. The bushes and shrubs are all overgrown and the grass is really patchy. With as often as we are in the yard, it is important to us to have a beautiful and comfortable outdoor space too. We completed the back yard and made a pergola and hung a wood clothesline and it’s beautiful. Now onto the front…but we are sourcing old brick and that takes a bit of time! Since this house is so old, everything we do must be customized. Shutters, window boxes, the front door…all of it is a long process to design and order. We are getting there and hope to be done by the middle of this summer. Because I stay home with the kids it was very important to us to make each room family friendly and comfortable for each one of us. I wouldn’t say we sacrificed beauty for functionality, but rather made it our mission to blend the two. I love decorating and moving things around and we’ve managed to create a simple and calming space to live in that also encourages creativity and imagination. A little intention goes a long way and we feel like this home is a true reflection of us as a family. Other than the neat fact that this home is almost one hundred years old, it’s special to us that this home still has so many of its original features. The shaker style pantry in the kitchen, the living room wall lighting, the wood floors, the tiling in the upstairs bathroom, the enamel sink and tub, the chandelier, the heavy doors and pulley windows. All of these things are just so beautiful to us. Hey Amanda! I know this an old post, but I just came searching for it because we just put an island in our kitchen with a butcher block top and I remembered you had posted about this! Thank you so much for the recipe! I have to ask, did you leave your butcher block otherwise untreated? People are pushing me to stain or at least seal our island, but I love the way that it looks naturally, as it is. I obviously don’t want to ruin it, so I’m hoping that not sealing it and just using this concoction to treat it will be just the ticket.